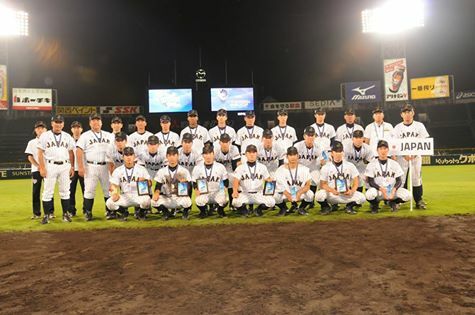 SAKA, Japan – On the historic stage of Hanshin Koshien Stadium, the United States U-18 National Team defeated host nation Japan, 2-1, in the finale of the XXVII WBSC U-18 Baseball World Cup Sunday night. Before an electric atmosphere of 15,000 fans, the U.S. captured its third consecutive world title (2012, 2013 and 2015), delivering Japan its one and only defeat in Osaka. U.S. gold-medal-game-winning pitcher Nick Pratto was named the Most Valuable Player of the 2015 U-18 Baseball World Cup. The U-18 world championship was featured live and free-to-air across Japan on TV Asahi – one of the most wide-reaching broadcasting networks in Japan. The junior flagship event was also one of the top trending topics on social media in Japan Sunday night. Earlier in the day, the South Korea U-18 National Team defeated Australia, 8-5, to earn the bronze medal. The XXVIII WBSC U-18 Baseball World Cup 2017 will be staged in Thunder Bay, Canada – host of the 2010 edition.